Him - "Our Point Of Departure"
The follow up to last year's Sworn Eyes (reviewed in AI #9), and the 4th release from Him, features more of the band's jazz oriented strangeness that incorporates lots of cool electronica and even a bit of psychedelia. On Our Point Of Departure the band consists of Doug Scharin on drums, percussion, and electronics, Carlo Cennamo on tenor sax, keyboards, and percussion, Fred Erskine on bass, trumpet, keyboards, and guitar, Sean Meadows on guitar, and Jon Theodore on percussion and keyboards. Titles and tracks are a bit irrelevant here as each track smoothly segues into the next making this more or less one continuous piece. But the disc starts off with some cool spacey jazz electronica. Kind of a heavy jazz version of Finland's Circle. A post-rock guitar and rhythm section provides the base upon which the tenor sax and drums build. But there's even a bit of a salsa feel to the music as well. The best moment is when the salsa rhythms maintain their pace while the spacey guitar and electronics swirl about. It's almost like the guitar and synths are in one dimension while the sax and drums are in familiar ethnic jazz territory. As the music develops the salsa rhythms remain, but we also hear some trippy psychedelic wah'd guitar with a groove. A bit like late 60's/early 70's Miles Davis. There are just too many stylistic combinations to accurately describe this music, but AI readers who dig jazz and various ethnic styles will like this. Later, on "Third Wish", the background is a raw Krautrock jamming sound. It's easy to miss if the listener is caught up in the tenor sax but that's how it sounded to my ears. And the closing track, "Persistent Life", is one of my favorites on the disc with its blazing sax against a somewhat dissonant bass and guitar along with fiery world music percussion. Wild! In summary, I liked Sworn Eyes but this is a step way beyond that disc. The percussion is still at the forefront, here along with the sax, but the oddball trippy factor is heightened several notches. 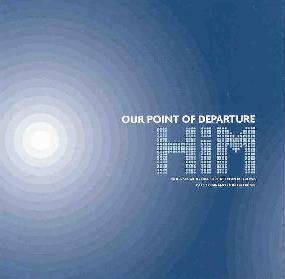 Our Point Of Departure is distributed by Perishable Records. You can visit their web site. Contact via snail mail at Perishable Records; PO Box 57-8804; Chicago, IL 60657-8804.